This summer two new books about Helsinki were published. They are not the usual tourist guide. 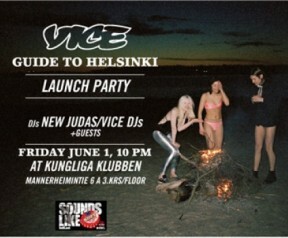 The Vice Guide to Helsinki and You Should Be Here! show a cheerful and modern city and discover its untold secrets. Timo Kühn, long time contributor of Vice Magazine, explains to FREE! how the Vice Guide was created. We wanted to have a different angle on the city,” Kühn expounds. Indeed. album cover design, was put together in a shockingly tight six days. Photos from Pekka Niittyvirta, Oskari Nolla, Riku Pihlanto, Miika Saksi, Jan Konsin, Sanna Charles, Joe Yarmush, and Mikko Matias Ryhänen capture Helsinki’s varied landscapes, alternately industrial and beautiful, but mostly the young people driving it forward. As Kühn says, “you cannot underestimate the value of young people’s ideas. There’s a certain group who are talented, but no one gathering everything together to market outward, which is what I tried to do with the guide. Something is starting to bubble. To cater to Eurovision madness back in May, Bulgaria Magazine put out a comprehensive, sometimes tongue in cheek, guide to Helsinki, You Should Be Here! Though sadly not on as prominent display around town now as then despite the influx of tourists (i.e. people with money who almost guaranteed do not speak Finnish) in the summer time, You Should Be Here! remains a helpful resource even for those who live here year round. Even if Helsinki appears to be a small city, cracking open this guide unlocks a wealth of places yet untapped and amusing cultural tidbits. Perhaps you’ve been too lazy to explore your own neighborhood yourself, spending your time in the over-crowded, tourist attractions. fashion, but are bored of Marimekko. You Should Be Here! paints a new urban portrait for the city, or at least one from the perspective of what the talented youth of the city are making, breaking, and of course, drinking. I, for one, was previously ignorant of the refreshing properties of fisu. While Vice Magazine has put out on even more recently a pocket-sized guide to Helsinki, the Bulgaria book has the practical advantage of depth: more neighborhoods covered, shops, the karaoke taxi, even local history. By virtue of being put out by Finland’s most offbeat design team, You Should Be Here! looks great as a coffee table book, completing your collection of Taschen, Rizzoli, and even color coordinates with the Phaidon Design Classic three volume set. Most importantly, You Should Be Here! serves as a reminder of why, indeed, we are here.